When it comes to places to see in Arizona on a visit to the Grand Canyon State, it’s incredibly easy to feel overwhelmed when choosing what to see first. It would be impossible to see every single thing in one week or even two weeks. Multiple trips or longer travel schedules are required given the wide variety of tourist attractions available in the state, especially if you hope to learn a bit about the Native American culture and experience the beauty that surrounds you. To help get you started, here are our five favourite places to see in Arizona. This human-made reservoir is on the Colorado River on the border of Arizona and Utah and has almost 2,000 miles of shorelines, along with the sun, warm water and fantastic weather. There are many different options for lodging on this beautiful lake. You can stay at many different resorts and hotels, rent a houseboat, or if camping is more your style, there are campsites suitable for tents and RV’s. Activities are endless. Rent a boat for the day or book a boat tour. Hike the trails, fish, golf, or even take a White River rafting guided tour down the Colorado River. If you like to shop, besides the gift shops located around the lake, you can make a trip back into town and spend the day in the city of Page. There are many places to eat on the Lake and back in town too. Lake Powell has everything, and no one in your family will be disappointed. TIP: Buy a National Park Pass. The annual pass is a money-saving bargain compared to paying individually at each park and it is valid for an entire year! While you are at it, check out MY favourite souvenir — The Passport to your National Parks! When it comes to places to see Arizona but NOT touch, doesn’t cacti come to mind? Check out this national park located near Tucson. This park was created to protect the Giant Saguaro. This cactus is not only magnificent but rare. 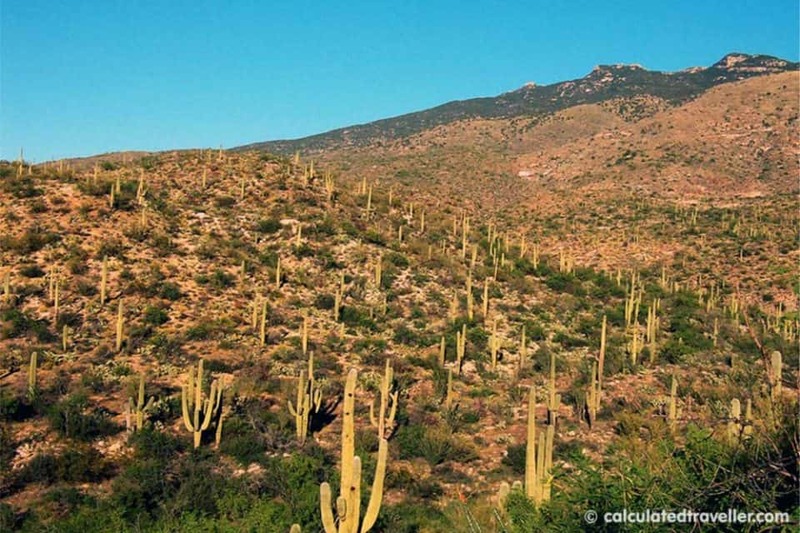 The best time to visit Saguaro National Park is in between November to May when the temperatures are not hot. If you wait till February and March to come to see these giants, you will be treated with one of the most dazzling sites in the desert. During these months, the cactus starts to bloom, and nothing is more pleasing to the eye than to see the vibrant colours across the brown landscape. The park also offers excellent hiking trails. Whether you are a beginner hiker or up for a challenge, there is a trail for you. Camping is available and packs your bikes there are great biking trails to explore. Close by in Phoenix you might also enjoy checking out the Desert Botanical Gardens. Read about it here. Oh, the spectacular views of Sedona. The red rock will take your breath away as you make your way into the town. One of the most popular destinations (and one of my favourites) in Sedona is Cathedral Rock. Located in Coconino National Forest, the red sandstone has been carved out over time to create the tourist attraction. The summit is 4,921 feet and has been a goal for many hikers each year. Although challenging the trail offers more of a rock climbing experience than a hike. Keep in mind that it can be steep in many places and with little shade. To reach the summit, it takes 1.5 miles one-way, but once you make your way to the top, the struggle is worth it. 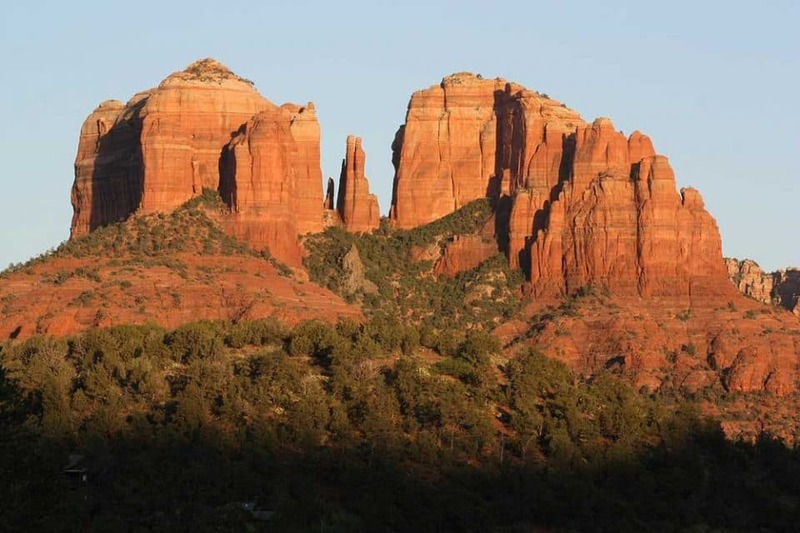 Of all the attractions in Arizona Sedona is one that you don’t’ want to skip. Photo buffs should make sure to have their camera ready for this one! Perhaps one of the most beautiful places to see in Arizona, this unique rock formation is on Navajo Nation land near Page just outside of Glen Canyon National Recreation Area. 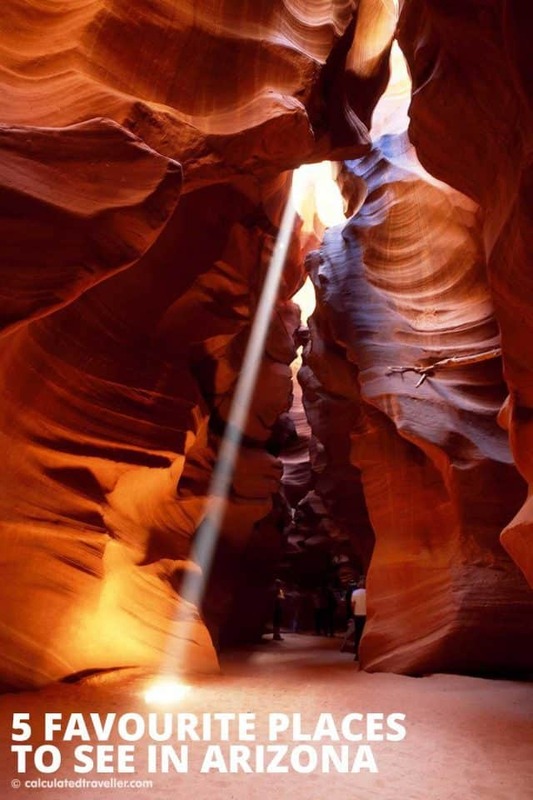 One of the most visited slot canyons in the Southwestern United States, Antelope Canyon is an amazing one of a kind wonder to appreciate truly. There is a fee to visit the canyon: $ 6.00 to enter the Navajo territory and another charge to the families that own the land around the Canyon. You can also book a Navajo Jeep tour. Having a guided tour will give you lots of information about the area and canyon. After seeing the canyon, you can drive over to Lake Powell to extend your trip. Perfect two for one destination visit. 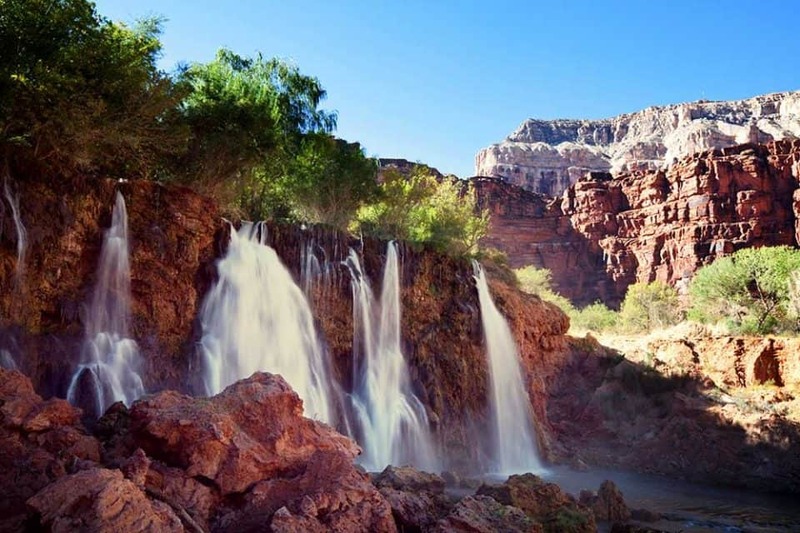 Hiking in the Grand Canyon will land you to the piece of paradise known as Havasu Falls. Many tours are offered, including a 3-day or 4-day hike, depending on what catches your fancy. The literal translation of Havasupai is “The people of the blue-green waters.” Once you see the turquoise colour of Havasu Creek, you will understand why it was named Havasupai. Due to the limestone and the calcium and magnesium water that leaches out of the caverns, the water looks as if it is turquoise in colour when the sun reflects off the minerals. If you are an experienced hiker and want to see a beautiful site, add Havasu Falls to your bucket list of destinations. These five destinations are sure to make for a memorable trip. Whether you are going solo, with a group of friends, or your family, everyone will be pleased with these choices. Enjoy your first of many visits to the Southwest! What suggestions do you have for unique places to see in Arizona? Check out these other articles in Arizona!